Random Musings – Sousei no Aquarion ~Uragiri no Tsubasa~ and D.Gray‐man Anime! The official Aquarion Blog has updated with an image of what appears to be a teaser poster for the next season of Sousei no Aquarion, tentatively titled 「裏切りの翼」 (Uragiri no Tsubasa – Wings of Betrayal). The title of that post is “??? @Media Factory Summer Festa 2006″ which is where I assume the poster was shown (you can find the website for the Summer Festa here). 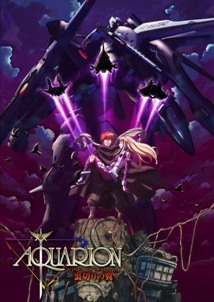 The teaser poster seems to show Apollo carrying Silvia with blacked out Vectors and an Aquarion in the background. Kind of hard to tell what the series is going to be about on just one poster though. The popular manga series D.Gray‐man is getting an anime! It was announced that it will begin airing in October, which is the same month that the DEATH NOTE anime is supposed to start (as shown in that link). The official website for the Bleach Movie, titled MEMORIES OF NOBODY, is open. Continue Reading "Random Musings – Sousei no Aquarion ~Uragiri no Tsubasa~ and D.Gray‐man Anime!" The official Aquarion Blog features this image you see to the side from the Tokyo International Anime Fair with the words “2006 Autumn.” No word yet whether this means that a sequel is in production or if it’s an OVA or a game or something. I’d certainly love to see a second series, but I won’t get my hopes too high just yet. Thanks to Guido and BluWacky for the head’s-up. This is semi-old news, but there’s going to be a Full Metal Panic! The Second Raid OVA coming out on May 26th. It’s supposed to be about a day in the life of Tessa, which would suggest that it’ll be a lot more light-hearted than TSR was. Continue Reading "Random Musings – Aquarion Season 2? Edition"
After Pierre teleport changes with Tsugumi, the three pilots go through the gate. The military is has already started to sortie with an entire horde of Cherubim, and Glen lands several artillery pieces that shell the Shadow Angel base. Continue Reading "Sousei no Aquarion – 25"
Snow is falling all over the world, paralyzing the population by turning them into plants. Sylvia tries to fly through one of the gates dumping out snow, but can’t. Continue Reading "Sousei no Aquarion – 24"
Glen is indeed a fusion of man and feather, courtesy of the military. Using two dummy pilots, Glen is able to freely change between Aquarion forms and does so frequently in his assault on Sirius. Continue Reading "Sousei no Aquarion – 23"
With Sirius now on Toma’s side, Reika and Silvia are emotionally suffering the most. Reika feels responsible for what happens, while Silvia misses her brother. Continue Reading "Sousei no Aquarion – 22"
Sirius has a dream about following a sea of petals to a rose. Sirius, unsure of what he is, has conversations with various people about their dreams. Continue Reading "Sousei no Aquarion – 21"
Apollo, Silvia, and Sirius are sent into battle to fight an army of shadow angels. After forming Aquarion, they hear the sound of a feather, then that of a child. Continue Reading "Sousei no Aquarion – 20"
During an assault on a glowing tower, Apollo, Sylvia, and Reika find themselves transported into a bizarro dream world. Sirius also lands in it after a failed teleport change. Continue Reading "Sousei no Aquarion – 19"
Gen Fudo decides that for everyone to know each other better, they will cosplay as each other. What ensues is a hilarious showing where Apollo and Sirius, Silvia and Reika, Pierre and Chloe all switch clothes and try to act each other out. Continue Reading "Sousei no Aquarion – 18"
While watching a vampire movie, Tsugumi notices that Jun has bite marks on his neck. Reika notices that Tsugumi also has bite marks. The next day, both Tsugumi and Jun are completely exhausted during class to the point where Jun faints. After regaining their energy, both realize that Rena recently sucked a wound of theirs. Continue Reading "Sousei no Aquarion – 16"
Pierre’s really out of it after he gets a letter from his sister saying that his old squeeze is getting married. He goes a bit crazy after a training session and gets locked up in a padded cell. Continue Reading "Sousei no Aquarion – 15"